Microsoft has announced the Content Holmes team from BITS Pilani as the India winners of the 15th edition of the Imagine Cup. The cup is aimed at fostering innovation among students in the country. The Content Holmes team created a one-click AI-based parenting solution that helps keep children secure from cyber-bullying. The team will now represent India at the upcoming worldwide finals to be held in Seattle, USA in July. The winners of the final stand to win $100,000. 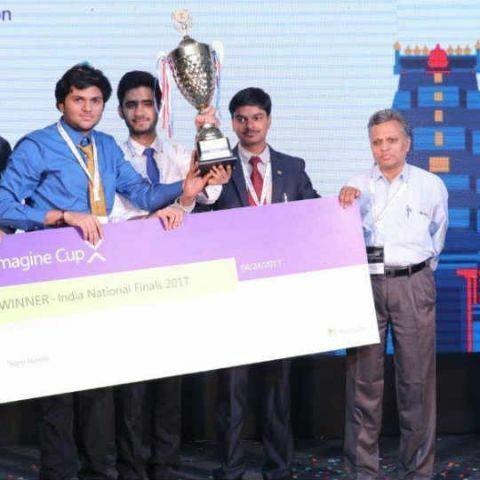 Microsoft India today announced the India winners of Imagine Cup 2017, after concluding the national finals held in New Delhi. Now in its 15th edition, Imagine Cup continues to foster innovation among students in the country and enables them to transform their ambitions into reality. With the vision of a one-click AI-based online parenting solution that helps to keep children secure from cyber-bullying, Content Holmes (BITS Pilani) emerged as the winner among 27 finalist teams from across the country. The team will now represent India at the upcoming worldwide finals in July in Seattle, USA, to compete among global teams for a USD 100,000 prize. Microsoft Imagine Cup continues to witness strong participation from India, as well as world over. This year, more than 15000 students registered from 1600 schools and colleges across the country. The winning teams showcased their innovative thinking, technical skills and ground-breaking solutions to address everyday challenges. A Soccer World Cup in India? This is a one-click AI based online parenting solution that will help keep children secure from cyber bullying and adult content online. The application assists and diagnoses the patients of Alzheimer’s and other degenerative diseases. The app hopes to reduce medical expenses and man hours. This team is developing the first ever virtual coach powered by Artifical Intelligence. White Cane is a personal assistant for the visually impaired that can help understand and discover the environment to relay information about the surroundings to the user. Imagine Cup is one of Microsoft’s many efforts to transform skill development, nurture budding technologists and foster collaborative and innovative spirit. This global technology competition boasts of several success stories emerging from the competition. Last year, Team KudaPehchano developed a real-time garbage management system using machine learning and vision techniques, while Team DIGIY developed an interesting game of suspense and Team AxeJulius built an app to publish ebooks and shared them with the public. After competing and winning the Imagine Cup India 2015 under the World Citizenship Category, Sanket Ghorpade launched his project into a company, Manage Code Cultivate. Based in Mumbai, the company is providing a solution called “Brain Board”, Windows desktop application which helps users to communicate even if he is not able to physically move and verbally challenged.